Do you love your iPad 2 and it’s special magical cover by Apple? But do you also feel something is missing? Like the back cover? How do you keep that precious Apple logo and back side from being scratched? Not to worry, HyperMac has you covered! The new HyperShield is a back cover for the iPad 2. The HyperShield is made of a durable TPU (Thermoplastic Polyurethane) which is a gel-like material that not only protects your device from scratches but also has shock absorbing properties for any bumps along the way. Putting the HyperShield back cover on is quite easy. Simply pop in the cover by matching the ports and cutouts. Press around the iPad 2 to snap on the cover and you’re done. You’ll notice that the back cover has all the cutouts for your ports, speakers, buttons, and camera. 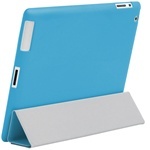 To finish it off, add the Apple iPad 2 cover and you got yourself beautiful matching ‘case’ for your iPad 2. The HyperShield has many desirable qualities any iPad 2 user would love. First, it comes in an array of colors — all matching any of the Apple iPad 2 covers you may have already purchased. Second, for those of you who love the new slim look of the iPad 2, you don’t have to worry about this back cover adding any extra bulk. It’s slim, yet protective. Third, it’s completely compatible with the Apple iPad 2 front cover. There’s a side cutout that allows the hinge on the Apple cover to attach nicely. Lastly, it’s quite stylish as well. It covers the iPad 2 where protection is needed, and also add a beautiful bevel around the edge of the iPad to bring the colors together. The only drawback is that the cutout on the left side for the hinge is wider than the hinge itself, so part of the aluminum back of the iPad 2 is exposed. The reason it’s there is so the hinge of the Apple iPad 2 cover would have a place to fold back on. It’s about the size of a pinky finger, so not too wide, but this may be a concern for some people. The HyperShield for iPad 2 is available in a big range of colors, including all the matching Apple covers and clear — gray, blue, green, orange, pink, cream, tan, black navy, and clear. Overall, I think the HyperShield makes the iPad 2 feel more complete, especially with an Apple iPad 2 cover. It’s also reasonably priced at $19.95. Disclosure: This product was sent by HyperMac for review purposes. This is part of Beatweek Magazine’s coverage of iPad products. Opinions expressed in this article are my own.